Elizabeth, of The Lawyer's Cookbook, is hosting this month's Food'N'Flix event. 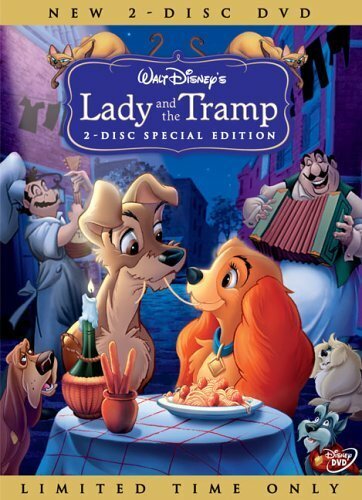 We watched, or rewatched as the case may be, Lady and the Tramp. Click to see Elizabeth's invitation. This post contains an affiliate link for the DVD at the bottom. Four words: this is a classic. I had no idea that this movie was originally made in 1955. "It's almost as old as Nonna," noted my little one. True! She's a classic, too. If you haven't seen this, here's the gist - it's a love story where Lady, a pampered cocker spaniel, meets and falls for Tramp, a roguish mutt from the wrong side of the tracks. There are, as with all good love stories, complications. But, in the end, Lady's humans - Dear and Darling - invite Tramp to stay. That's all I'll say. If you haven't seen it, do! How could I not make pasta? I mean, it's even on the cover of the DVD, right?? So, I had one of my pasta-making Kitchen Elves help me while I made the sauce. The other one was busy working on a school project. They were moderately good sports about the photo shoot. I had to do it, right? "Mom," complained the bigger one, "do I have to?" Yes. C'mon, you love your brother. "Not like that," he objected. Still, he obliged, grudgingly. I know he isn't going to humor me forever, so I'll take it when I can get it. 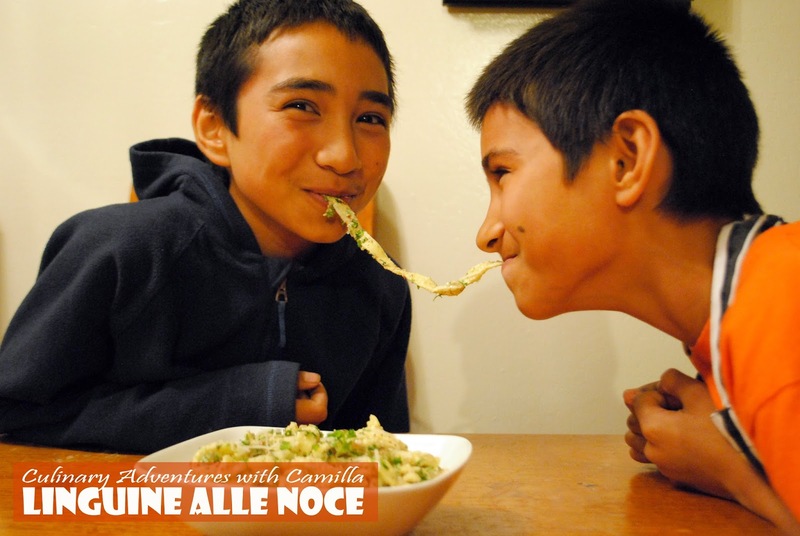 A quick note about the title: noce typically refers to walnuts in Italian. But since it really just means 'nuts' I went with it. I used almonds and pecans since walnuts are not a favorite in my household. 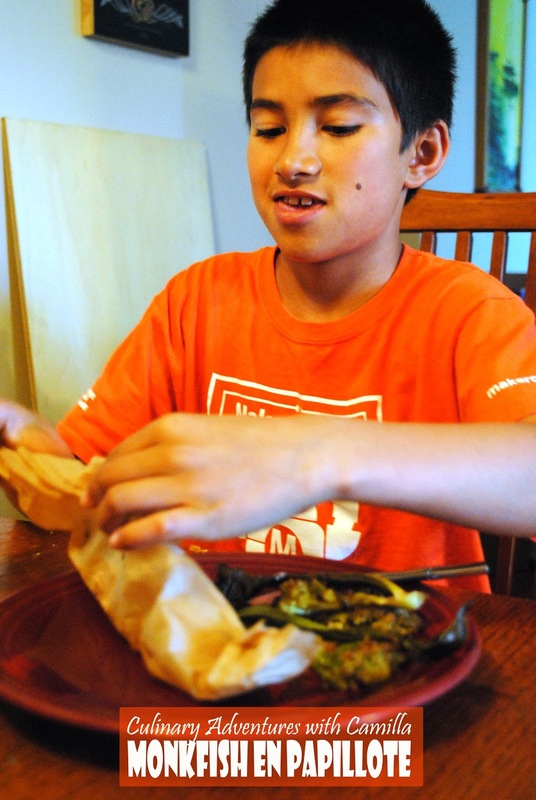 Place the flour in a heap on a piece of wax paper. 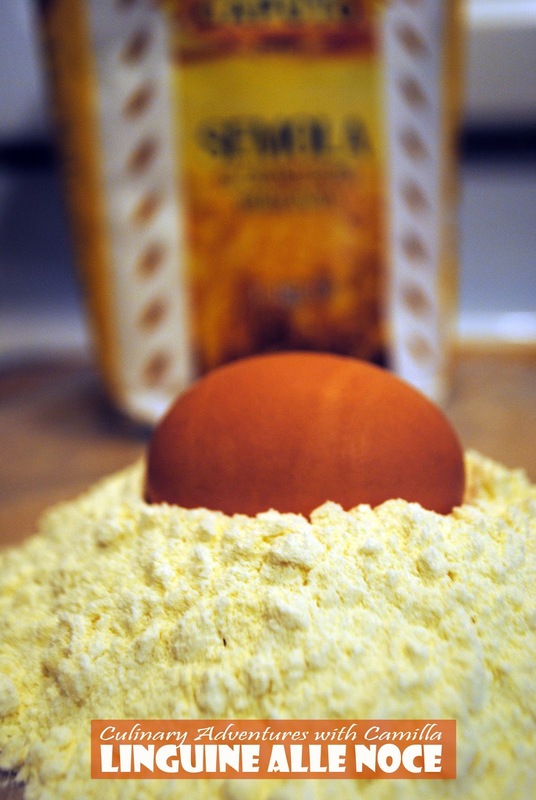 Create a deep well in the middle of the flour with the egg. 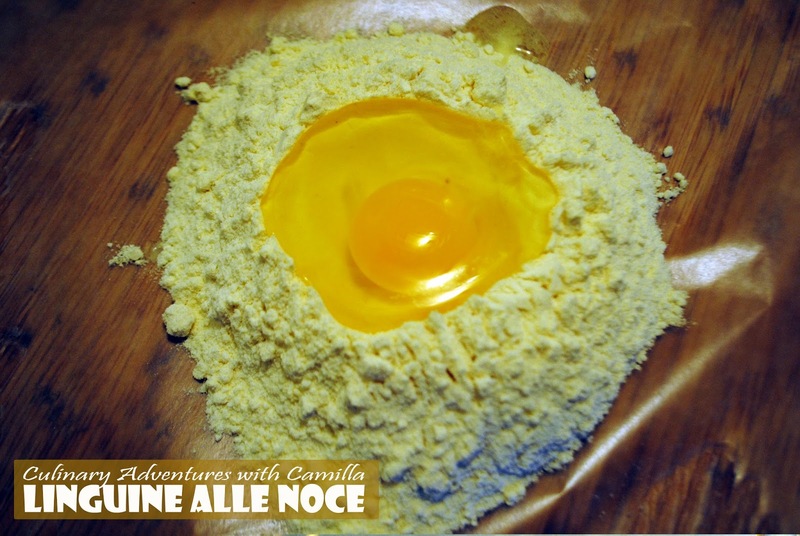 Crack the egg into the hole. If you're adding anything in, do it at the bottom of your well...before adding the egg. Whisk the egg into the flour with the fork. Add water one tablespoon at a time. 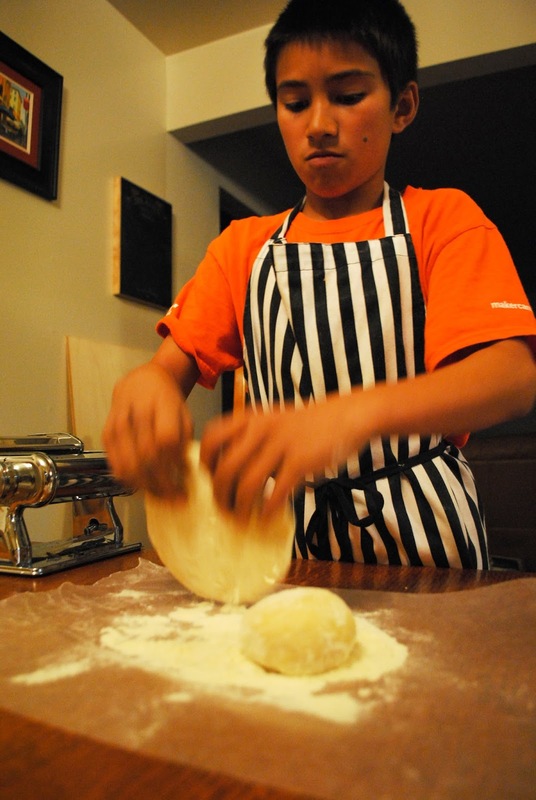 Once the dough comes together in a ball, begin gently folding the dough on itself, flattening, and folding again. Once it's firm enough to knead, knead the dough, incorporating more flour, as needed, to prevent the dough from sticking to your workspace. 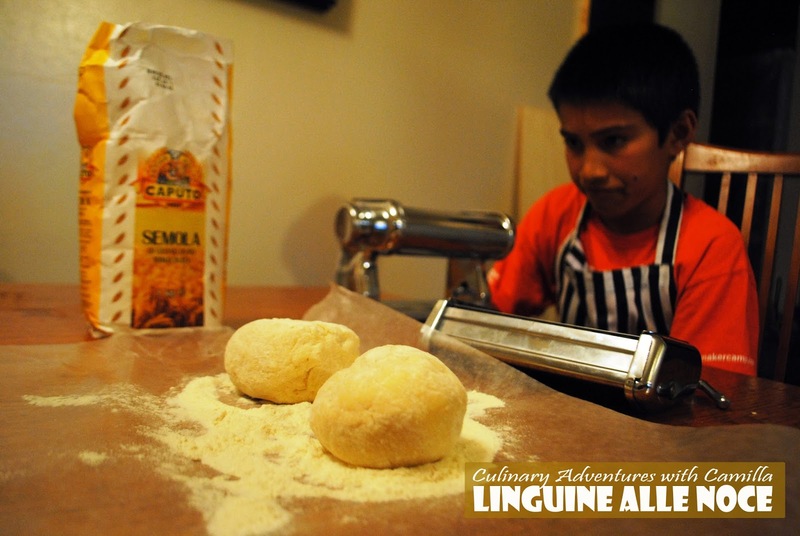 When you have a cohesive dough ball, set your pasta machine to the thickest setting, usually marked "1". 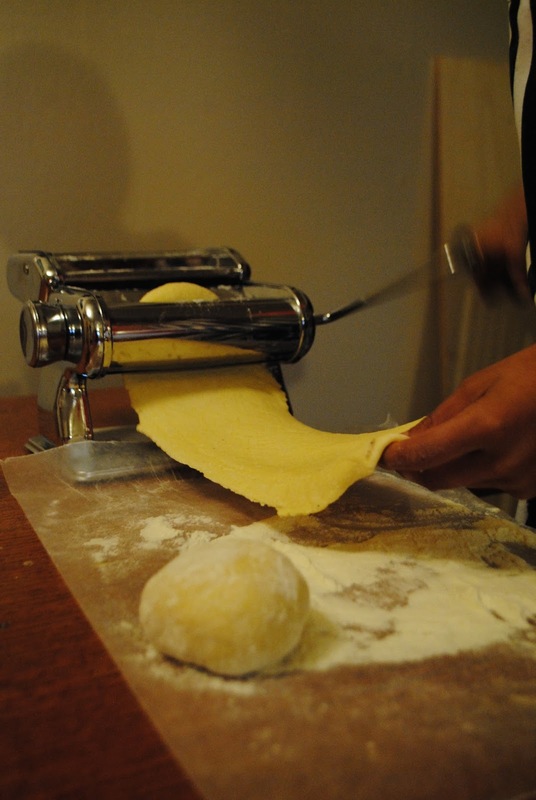 Flatten a piece of dough into a thick disk between your hands and feed it through the pasta roller. Repeat two more times. Fold this piece of dough into thirds, like folding a letter, and press it between your hands again. Now run the pasta through the machine 1 time on each of the settings 2-6. 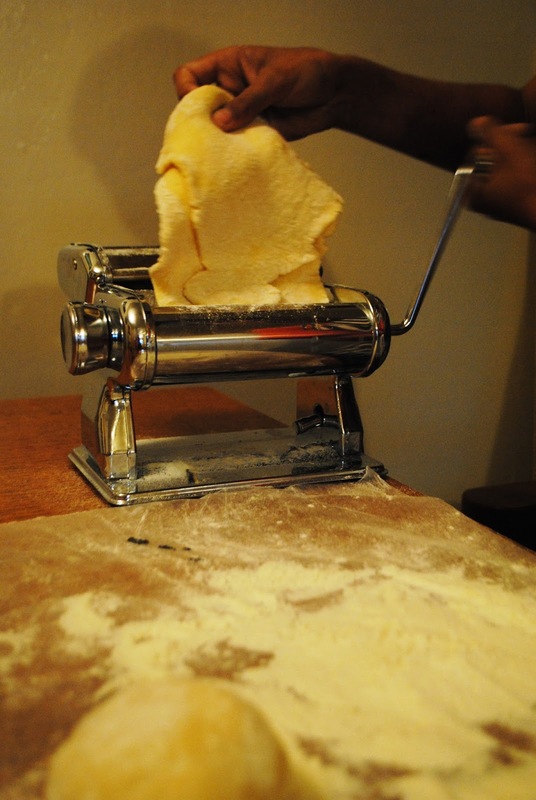 Finally, run the pasta through the cutter.Toss the noodles with a little flour to keep them from sticking together. Place the milk, crushed garlic cloves, and nuts in a medium saucepan. Bring the mixture to a boil. then remove from heat and let steep for 10 minutes. Place the ingredients in a blender. Add 3/4 C cheese, 3/4 C parsley, and a splash of olive oil. Blend till smooth. To cook the pasta, bring a large pot of water to a boil, salt the water, and cook the pasta until al dente, 2 to 3 minutes. 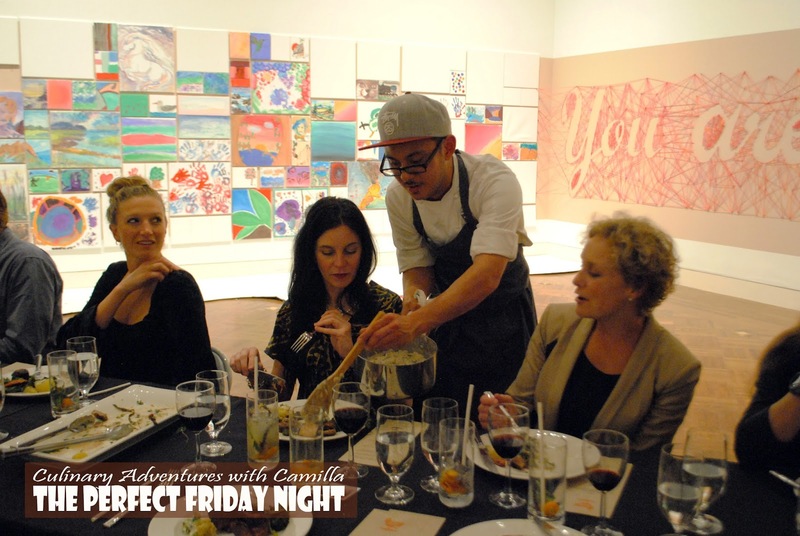 To serve: drain the pasta in a colander and pour the pasta into large mixing bowl. Add in the nut mixture - one tablespoon at a time - until you get the coverage you want. Toss with a bit of the cooking water and a splash more olive oil. Garnish with a pinch of cheese, a sprinkle of parsley, and some salt and pepper. Pronto al tavolo! What a fun viewing. Thanks for hosting, Elizabeth. We'll be back in March when Joanne at What's on the List? is hosting. We'll be watching The Quiet Man. Stay tuned for her invitation. 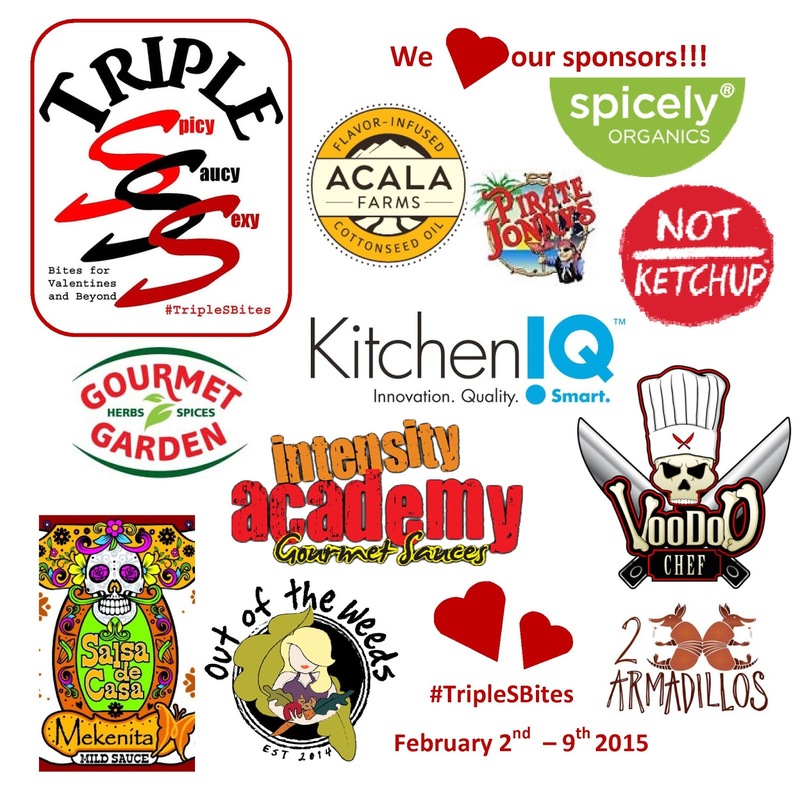 Earlier this month I hosted an 8-day online event celebrating food and romance - #TripleSBites. Along with 19 other bloggers, we shared over 130 recipes. I wanted to give my readers an easy way to view the recipes from each sponsor. 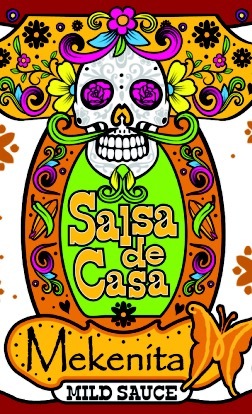 Here are the recipes posted using Mekenita Mexican Grille's Salsa de Casa. Thanks, again, for sending product to the bloggers and for providing a wonderful prize package for our readers! Check out everything from ceviche to risotto. These recipes are listed in alphabetical not chronological posting order. Enjoy! No story, really. 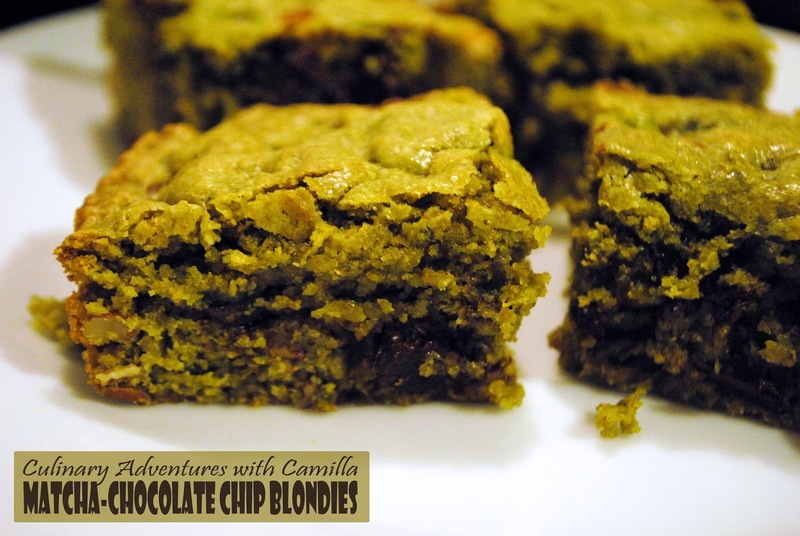 I was craving something sweet and had ingredients to whip up these green-hued treats. I also love that it's a one pot, one bowl, and one baking dish creation. Preheat oven to 350°F. In a large bowl, combine the sugar, butter, and eggs just until blended. Combine the flour, baking powder, and matcha; add to sugar mixture. Fold in chocolate chips and nuts. Spoon into a greased 8" x 8" baking pan and spread with a spatula to reach the edges of the pan. Bake for 20-22 minutes or until a toothpick inserted near the center comes out clean. Cool on a wire rack. Cut into squares. I wanted to give my readers an easy way to view the recipes from each sponsor. Here are the 10 recipes posted using Pirate Jonny's Syrena's Seduction Sauce. Thanks, again, for sending product to the bloggers and for providing a wonderful prize package for our readers! 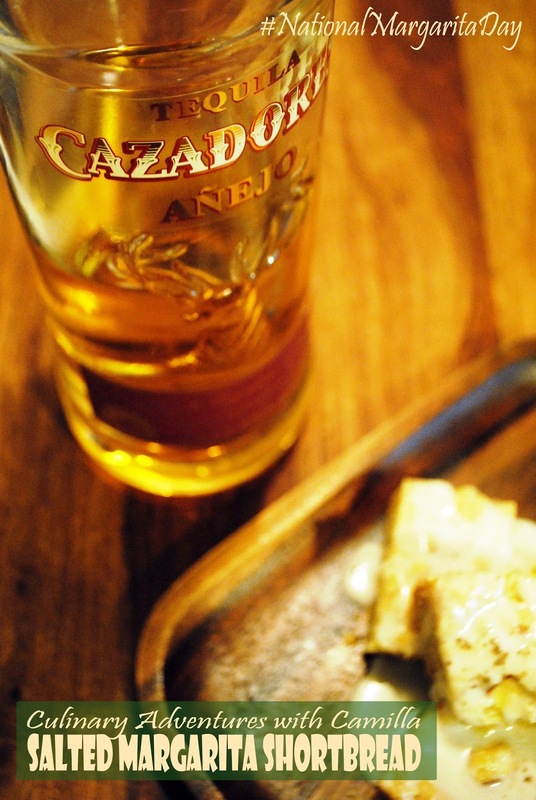 Check out everything from tostadas to kimchi. These recipes are listed in alphabetical not chronological posting order. Enjoy! Tara of Tara's Multicultural Table is having had a baby! Congratulations, Mamma ! Both are happy and healthy though the baby did decide to come a wee bit early. 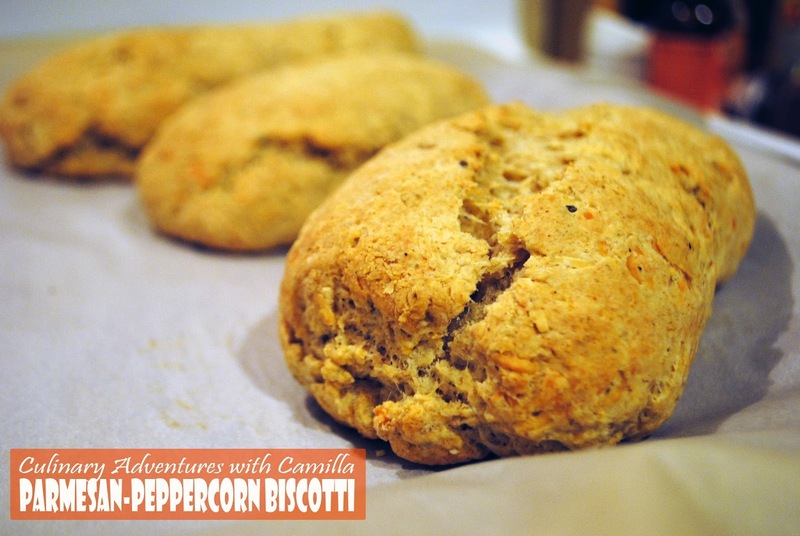 In typical foodie fashion, her virtual baby shower is all about food - biscotti to be exact. Thanks for hosting, Lauren of Sew You Think You Can Cook. I've done a fair share of sweet biscotti - Spiced Chestnut Biscotti, Birthday Biscotti, Chocolate-Dipped Pumpkin Biscotti, and even a Chocolate-Kalamata Cantucci. But, given my bent for experimenting and my decided lack of a sweet tooth, I opted to go savory. No real surprise there, right? 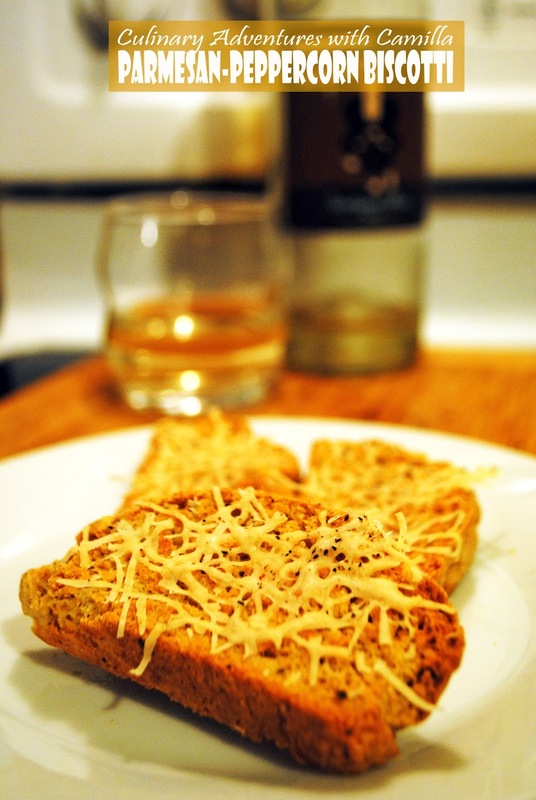 Biscotti, in Italian, simply means 'twice-cooked.' The second baking gives these savory biscotti a beautiful crisp texture while the parmesan adds a richness and the peppercorns lend a piquant bite. Yum. In a large bowl, mix together butter, eggs, and ricotta. In another bowl, combine flour, baking powder, and pepper; mix into egg mixture to form a stiff dough. Knead in parmesan. When cool enough to touch, cut into 3/4-inch thick diagonal slices. Place sliced biscotti on cookie sheet, and bake an additional 15 minutes on each side, or until toasted and crispy. 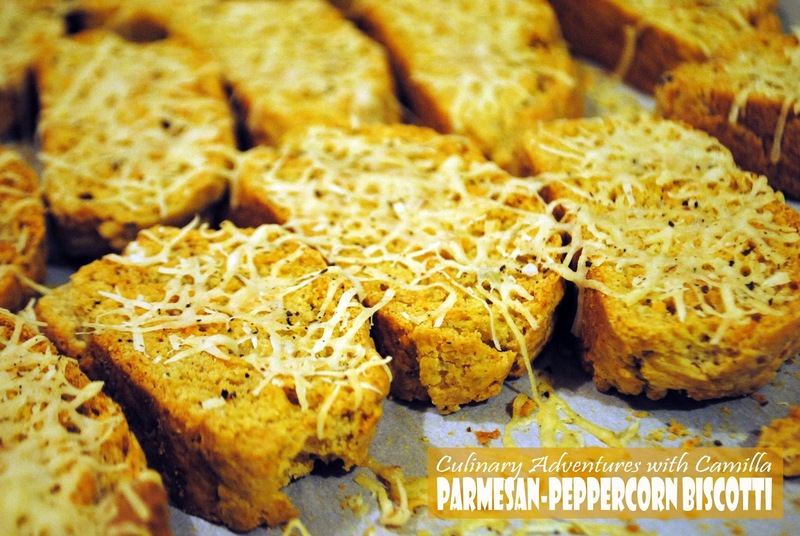 To finish, sprinkle with more shredded cheese and a dash of pepper. Bake for a final 10 minutes. Congratulations...and cheers for new babies. Thanks, Lauren, for hosting such a great event. Here are the rest of the party participants! 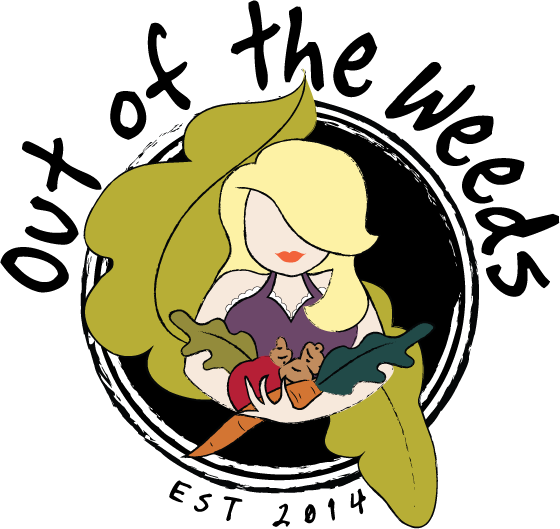 I wanted to give my readers an easy way to view the recipes from each sponsor. Here are the recipes posted using Out of the Weeds's Beet Vinaigrette. Thanks, again, for sending product to the bloggers and for providing a wonderful prize package for our readers! Check out everything from roasted ahi to salad. These recipes are listed in alphabetical not chronological posting order. Enjoy! I wanted to give my readers an easy way to view the recipes from each sponsor. 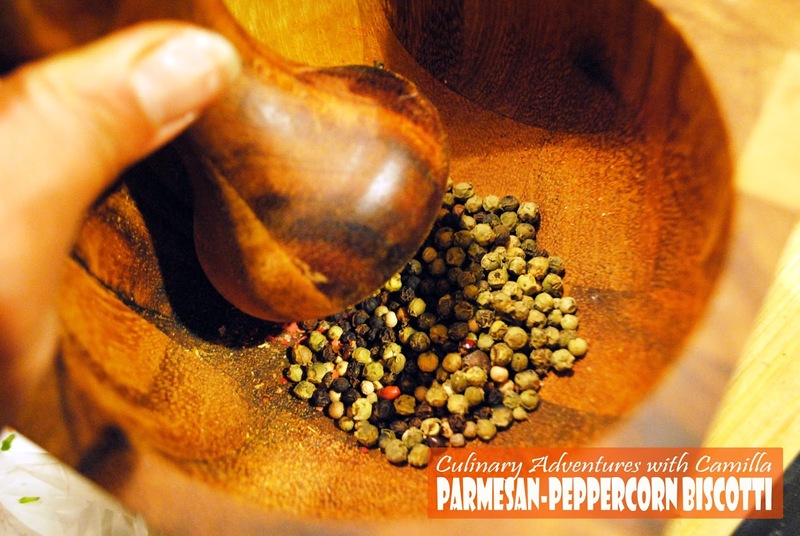 Here are the 10 recipes posted using Kitchen IQ's V-Etched Spice Grinder. Thanks, again, for sending product to the bloggers and for providing a wonderful prize package for our readers! Check out everything from dumplings to rice bowls. These recipes are listed in alphabetical not chronological posting order. Enjoy! I had some leftover sausages from the dish I was going to make for Carnevale. And I wanted to try something new (to us). 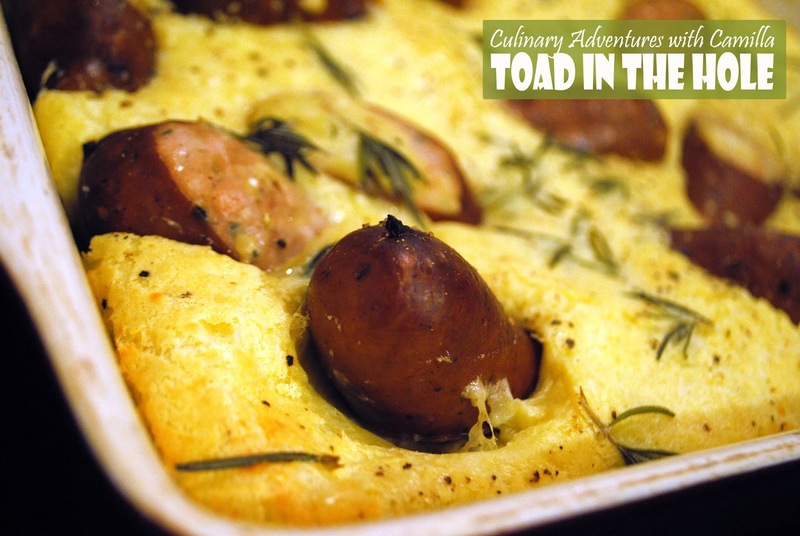 I remember seeing a photo of Toad in the Hole and decided to give it a go. The origin on the dish's name - Toad in the Hole - is somewhat disputed. The explanation that resonates with me: it resembles a toad sticking its head out of a hole. This was a hit for seventy-five percent of the family. The Enthusiastic Kitchen Elf said: "It's too eggy - and there isn't enough flavor." But, heck, it was easy. And, for the record, I thought it had plenty of flavor. I read several different version of this recipe before coming up with this process. Note: this is my variation; it's not ultra-traditional. Slice sausages into thirds. Butter your baking dish - we used a 9" x 13" - and place the sausages in the dish. I stood them a few of them on their cut end so that, like a toad, they sat upright. Preheat oven to 425° F. Whisk milk and eggs together until well-combined. 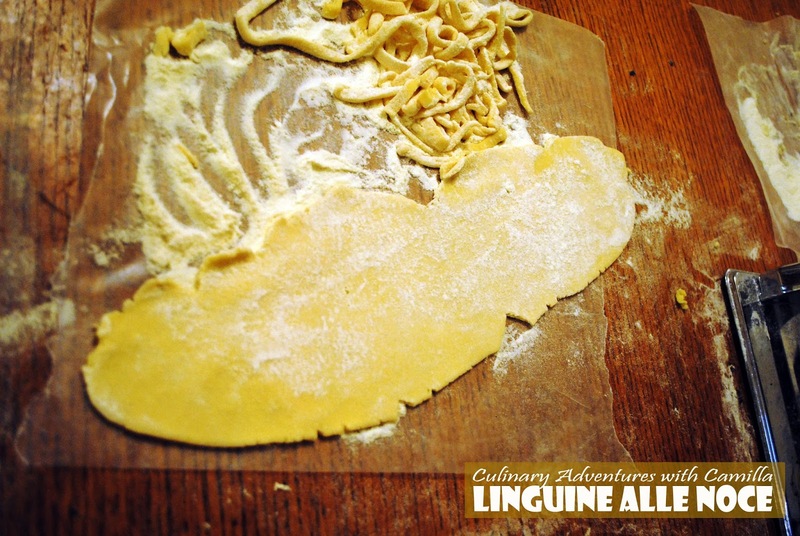 Fold in the flour and whisk until there are no more lumps. Let rest for 10 minutes. Pour batter into baking dish, around the sausages. Sprinkle with freshly ground salt and pepper. Scatter pieces of fresh rosemary over the top. Bake until golden and set, approximately 25 to 30 minutes. This is traditionally served with an onion gravy. I served it with a warm beet-kale relish. 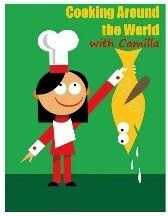 I wanted to give my readers an easy way to view the recipes from each sponsor. Here are the 10 recipes, or mentions, posted using Spicely Organics goodies. Thanks, again, for sending product to the bloggers and for providing a wonderful prize package for our readers! 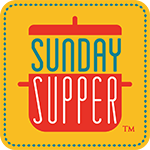 Check out everything from chicken mole to blondies and lip balm to creme brulee. These recipes are listed in alphabetical not chronological posting order. Enjoy! This round Deb, of Kahakai Kitchen, selected Comfort Me With Apples: More Adventures at the Table by Ruth Reichl for our February-March 2015 Cook the Books project. Click to see her invitation. And you have plenty of time to join the party, if you wish. Submissions aren't due till March 30th. I certainly know who Ruth Reichl is; she's a culinary powerhouse who headed the editorial desk - for years - at one of my favorite magazines in the world, Gourmet. I did not, however, read her first memoir Tender at the Bone: Growing Up at the Table. Though this book picks up where that one leaves off, I'm told, I don't think you need to read that before this. It stands alone. Let me set the scene. Ruth is just launching into her life as a restaurant critic, living in a commune of sorts on Channing Way in Berkeley and married to an artist who travels a lot. I'll admit - I almost put this book down several times in the beginning. I found her infidelities (Yes, plural. Sorry for the spoiler!) off-putting. At what felt like an avoidable demise of a marriage, I kept reminding myself Stop judging! It was challenging, but by the end of the book, I was crying with her at the loss of her Gavi (sorry, another spoiler). I was on her side. I was rooting for her. And I certainly will pick up other titles by her. While I found myself wishing for a little bit more restraint as she described her personal life, I longed for her descriptions about the food to go on and on. 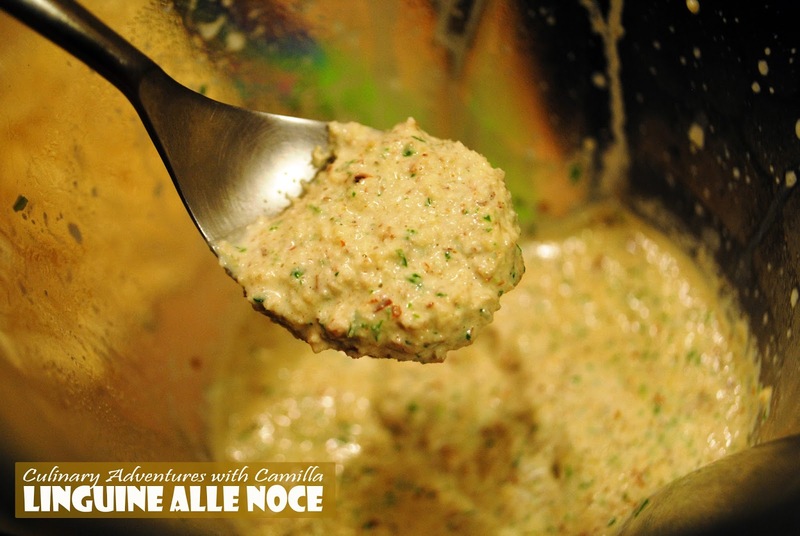 "We began with a deep green vegetable purée sprinkled with herbs. ...Afterward we had raspberry ice cream that was the color of a Renaissance sunset. I held it in my mouth, loath to let the flavor vanish. Just churned, it did not taste as if it had been made by human hands. The cream seemed straight from nature, from happy cows who had spent their lives lapping up berries and sugar." Initially, I found myself returning to this passage. I had dog-earred the page and read it more than a dozen times. 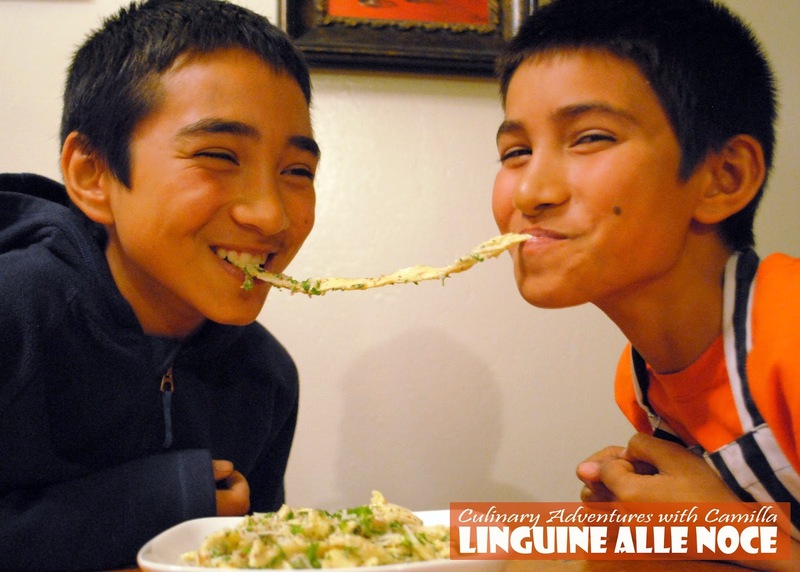 "Wrapped in fumes of garlic, we ate galatines of pigeon, duck, and quail with garlic mosaics. 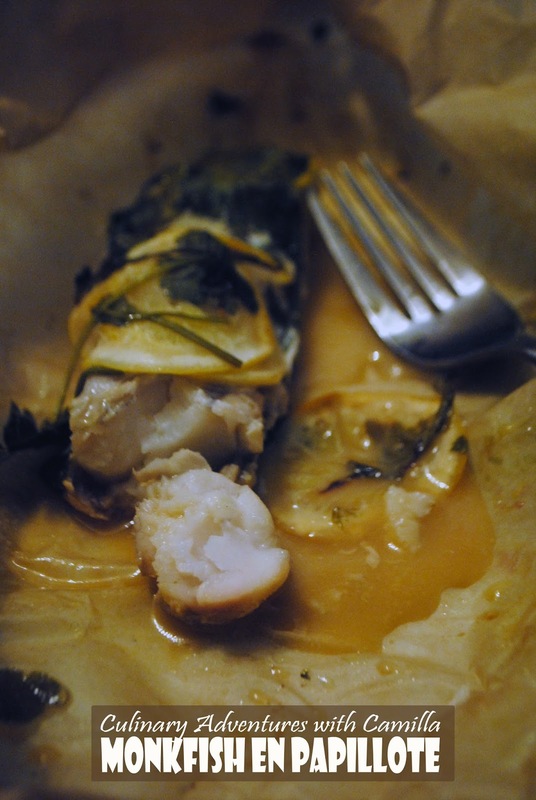 We consumed more wine as several whole baked fish, gorgeously wrapped in puffs of garlic pastry and drizzled with lobster butter, were paraded around the dining room. Platters of spring lamb were brought out, surround by three garlic-infused purées. We washed the meat down with oceans of deep, dark Zinfandel." I was captivated and think I will eventually replicate one or more of those dishes. But, in the end, I was compelled by Ruth and Michael's spectacularly disastrous Thanksgiving dinner at The New Bonneville Hotel. No, I didn't make the inedible Medieval turkey - "Well, it turns out there's a reason they stopped using that recipe eight hundred years ago." - or a trio of pies, or preserved peaches, or homemade goat cheese. Nor did I make any of the three recipes she shared at the end of that chapter. I will. Soon. That raspberry ice cream, the color of a Renaissance sunset, sounds delectable. Instead, on a chilly, grey evening while the fire crackled in the living room, I whipped up a pot of butternut squash soup. 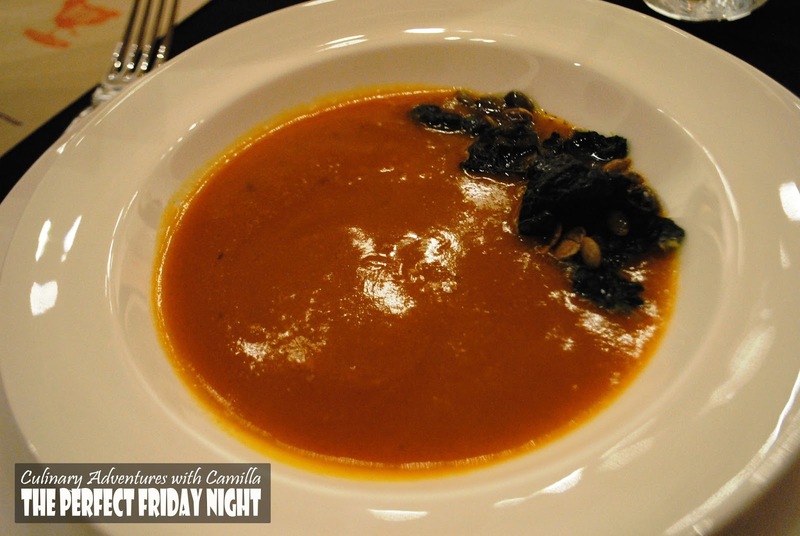 "The squash purée was bright orange with an earthy sweetness. Cream was drizzled through it, making patterns. Chives were strewn across the top. 'Okay,' said Michael. 'I'll admit it. It's the best soup I've ever tasted. I could eat ten bowls.'" Unlike the Bonneville, I do not have a luscious vegetable garden, but I do have access to amazingly fresh and delicious vegetables through local-to-me farms. 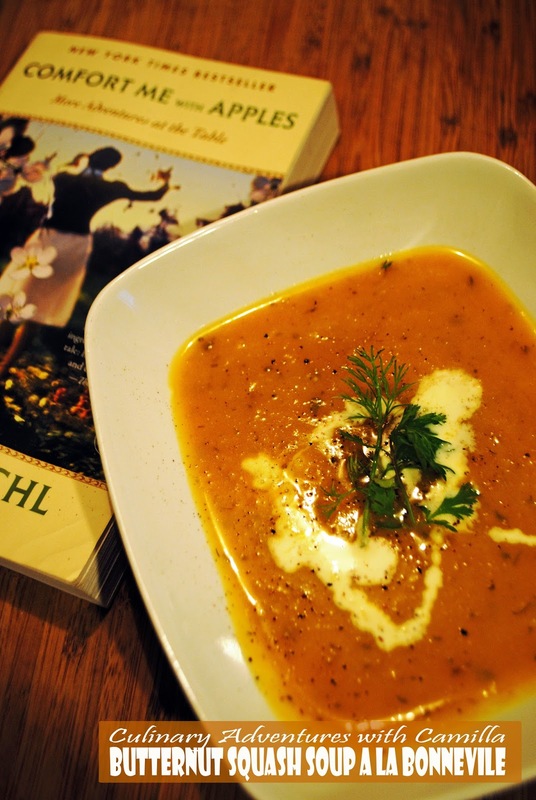 This soup was made with butternut squash, leeks, and fennel from our High Ground Organics CSA and fresh herbs from Serendity Farms. 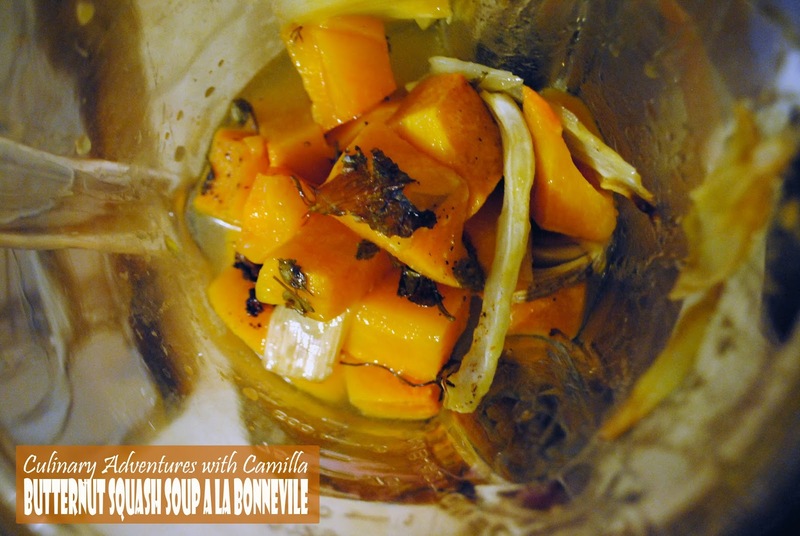 Preheat oven to 350 degrees F. Place the squash, fennel, and leek pieces together in a large mixing bowl. Add a splash of olive oil and toss to coat. Spoon the vegetables out in a single layer on a parchment lined baking sheet. 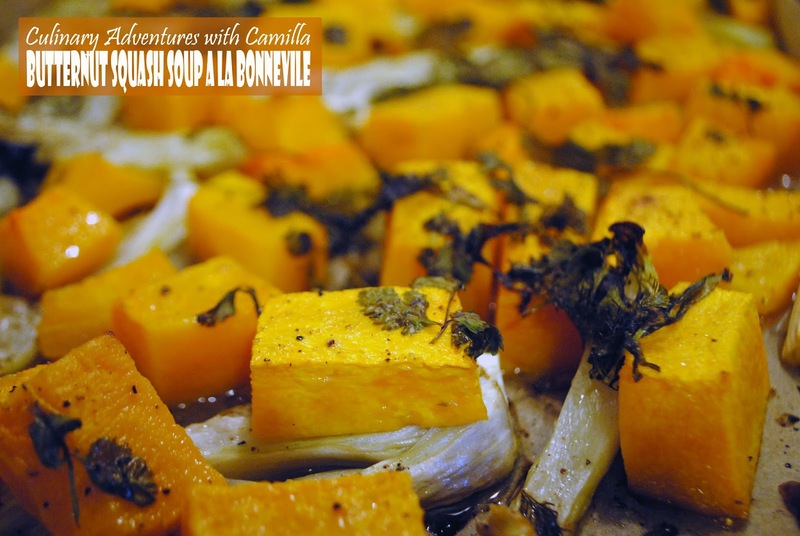 Sprinkle herbs over the top and roast for 45 to 50 minutes - till the vegetables are soft and slightly caramelized. In batches, blend the roasted vegetables with chicken stock until smooth. Return your purée to the pot. Add more stock if the soup is too thick. Heat till just warmed through. Ladle into individual bowls for serving. 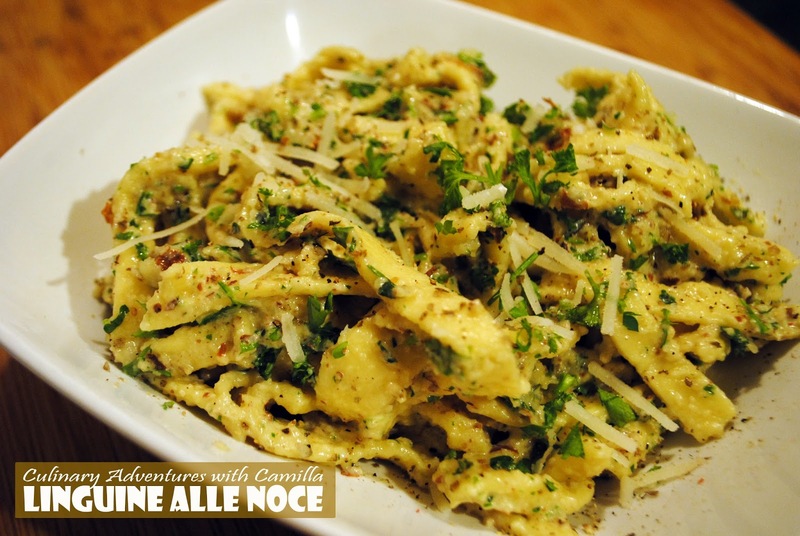 Drizzle with cream, sprinkle with salt and pepper, and top with fresh herbs. Next up for Cook the Books...Debra of Eliot's Eats selected our April-May selection. The Feast Nearby: How I lost my job, buried a marriage, and found my way by keeping chickens, foraging, preserving, bartering, and eating locally (all on $40 a week) by Robin Mather, Hope you'll join us. *This blog currently has a partnership with Amazon.com in their affiliate program, which gives me a small percentage of sales if you buy a product through a link on my blog. If you are uncomfortable with this, feel free to go directly to Amazon.com and search for the book or item of your choice. Tequila and I are not actually very good friends. Maybe I need to buy more expensive tequila. But I am a fan of cooking with it! Still when I saw an invitation from my blogging pal Heather at girlichef to make something for #NationalMargaritaDay, I jumped right in. Last year I made Top Shelf Truffles. 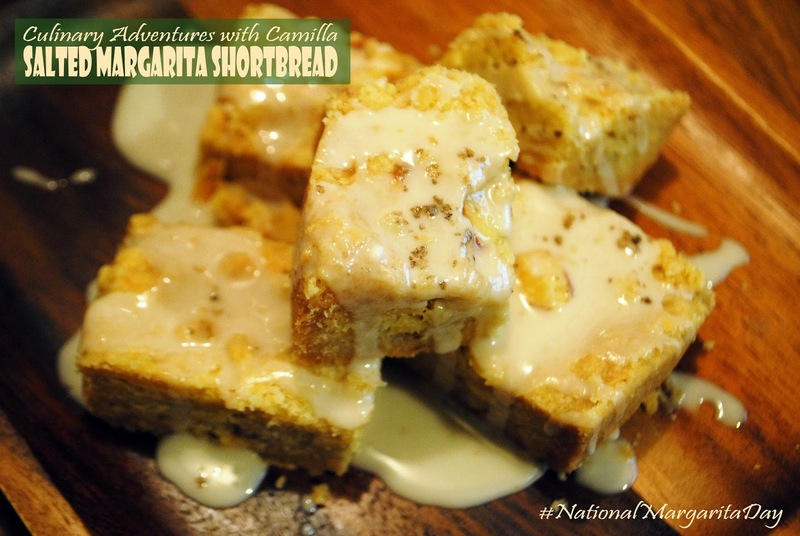 I considered doing something savory this year, but opted for a margarita shortbread cookie kissed with a tequila drizzle. Salud! In a large mixing bowl, whisk together the flour, sugar, tequila, lemon zest, and fleur de sel. Pour in the olive oil and stir until the dry mixture is completely incorporated into a cohesive ball. Transfer the dough to a baking dish - I used a 9"x13" rectangle. My stoneware didn't require greasing, but you might want to grease your dish first. Use your fingers to press the dough into an even layer. Prick the surface of the dough all over with a fork; I also cut score marks for the squares. Bake until the surface feels firm to the touch and is slightly golden around the edges, approximately 50 to 55 minutes. Remove from oven, re-score the shortbread, and let cool for 20 minutes. Using a very sharp knife, slice the shortbread into the squares. Let cool completely before removing from the pan. 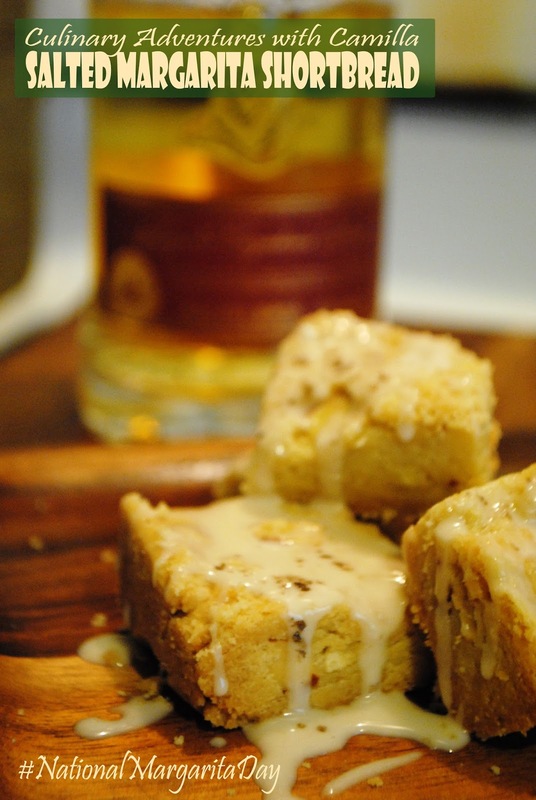 To serve place your shortbread squares on a plate and drizzle with glaze. Sprinkle with salt to garnish. 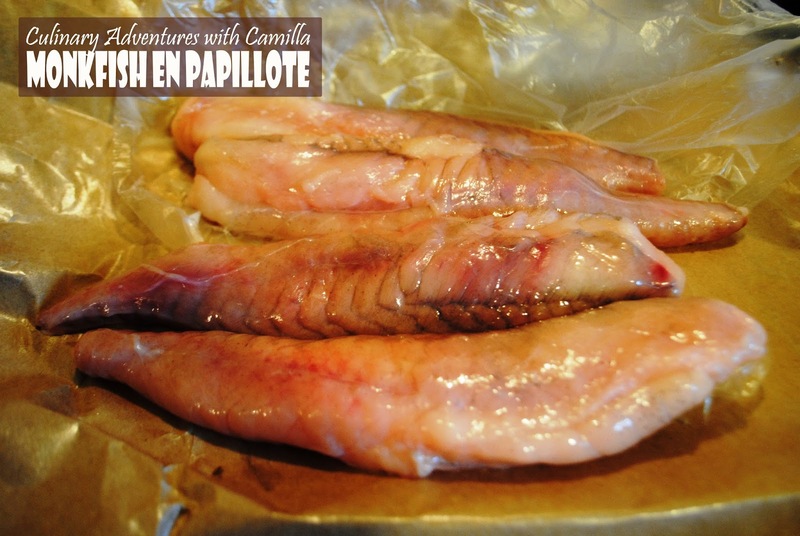 I had never heard of monkfish till I read Confessions of a Culinary Diva's most recent #winePW post: Boulud and Bubbles. Though her dish wasn't a complete success, I was intrigued by her characterization of it as 'poor man's lobster.' I just had to try it. Additionally, monkfish is listed as a good alternative on Monterey Bay Aquarium's Seafood Watch. So, when I saw some at the fish market, I scooped up four pieces for lunch. 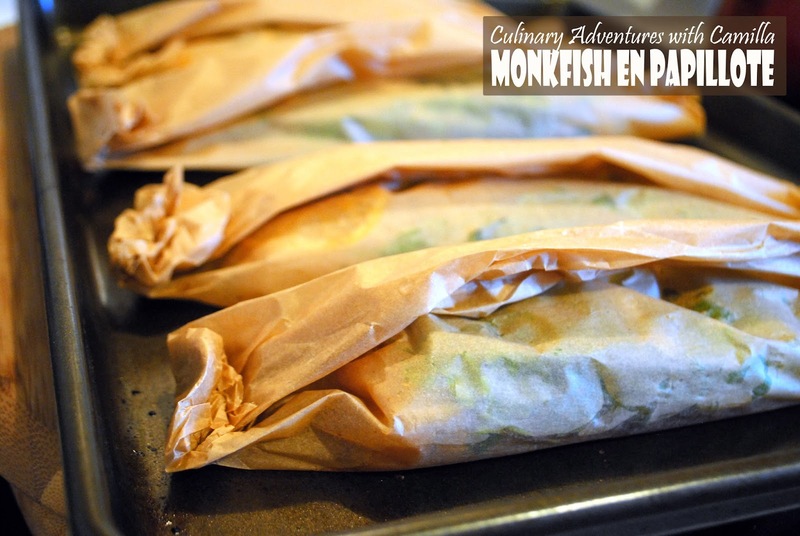 Preheat the oven to 400 degrees F. Lay one filet on a piece of parchment paper, approximately 12" square - or enough that you can completely envelop your filet and create a parchment packet. Cover the filet with lemon slices and sprinkle it with herbs. Drizzle the filet with olive oil. Sprinkle with freshly ground pepper. 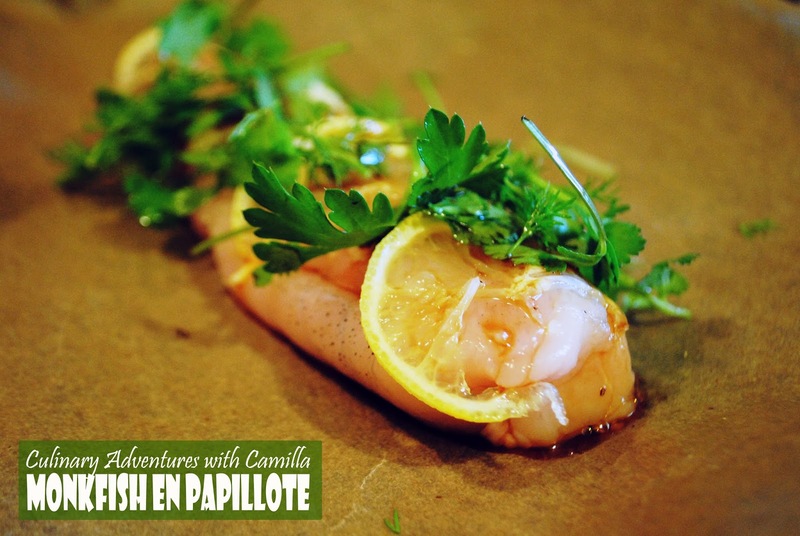 Bring the sides of the parchment up around the filet and fold the edges together, rolling it down to the fish. Crimp the ends together, folding them in till fish is enclosed. Place the packets on a baking sheet. Roast for 25 minutes. Remove pan from the oven and let steam for another five minutes. Serve the packets on a plate and let each diner open his or her own. Most Friday evenings all I want to do is come home from work, slip into comfy clothes, whip up a filling dinner, and lounge with my boys, playing games or watching a movie. But every now and then, Jake and I ditch the kids for uninterrupted conversation and a little romance. 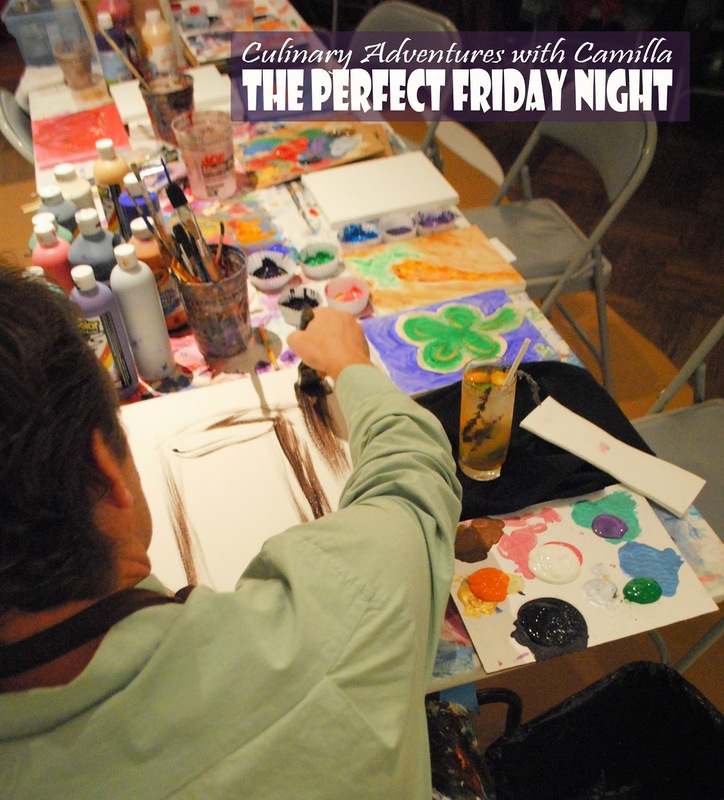 After seventeen years, I now know the formula for the perfect Friday night: art, libations, and food. 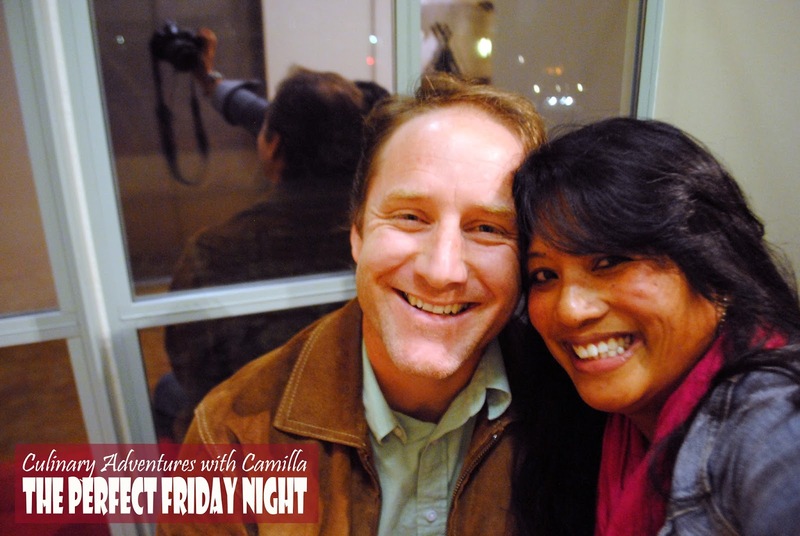 And it fell into my lap when I saw the announcement for Carmel Belle's Pop-Up dinner at the Monterey Museum of Art, La Mirada. One week late for a Valentines' celebration...but, hey, romance happens all year long, right? No need to stick to February 14th. And thank goodness I didn't hesitate, the tickets sold out in less than a day for this inaugural event. So, along with 58 other people, we lined up, checked in, and were ushered down the corridor to a cocktail reception with drinks from the elegantly effervescent and lovely Lauren of Lauren De Vine Beverages. I had seen her post on facebook about making kumquat shrub and knew we were in for a treat. 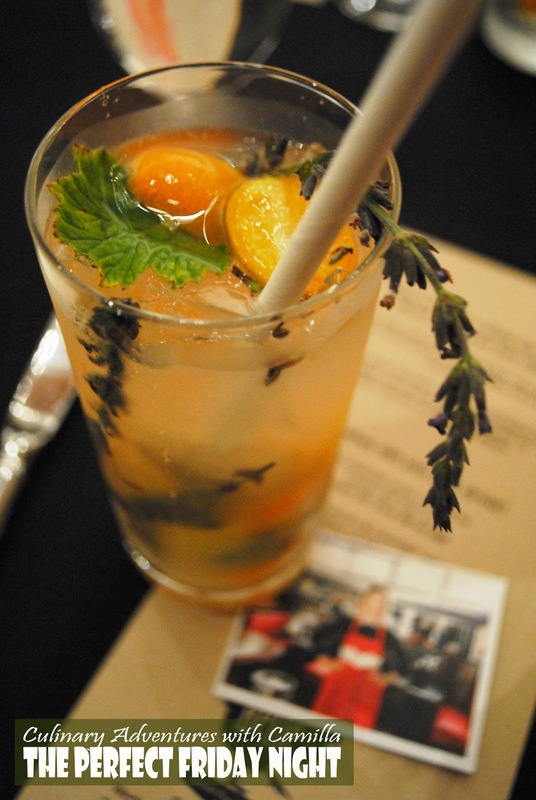 Kumquat shrub + lavender and rose geranium from Serendipity Farms + (optional) vodka = beverage bliss. 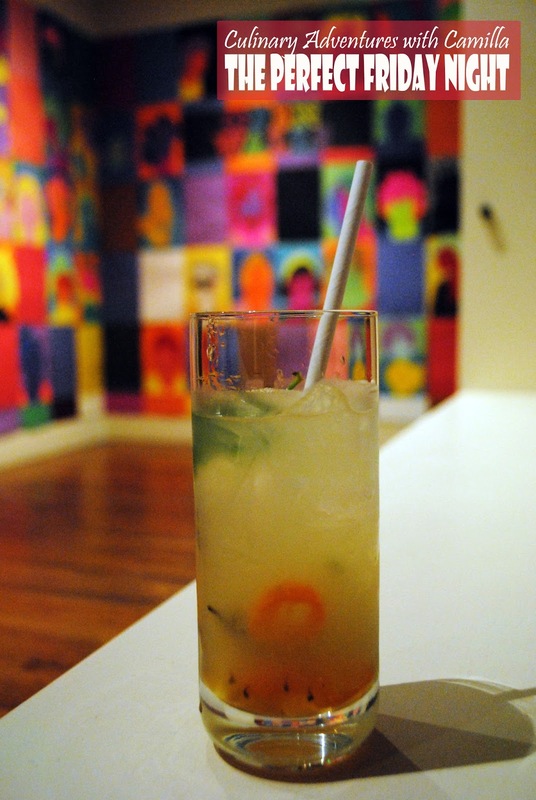 Not only was the cocktail delicious, but it inspired Jake's painting. 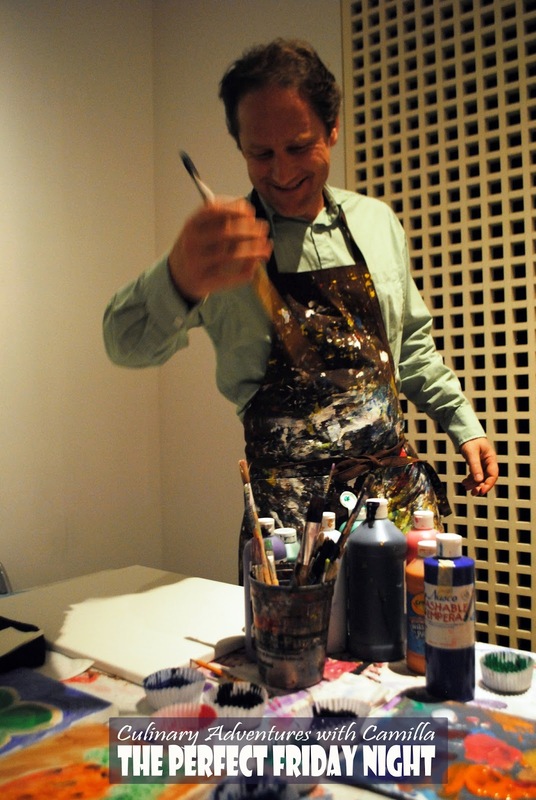 The museum had set up a painting station as part of its interactive Open Walls exhibit. 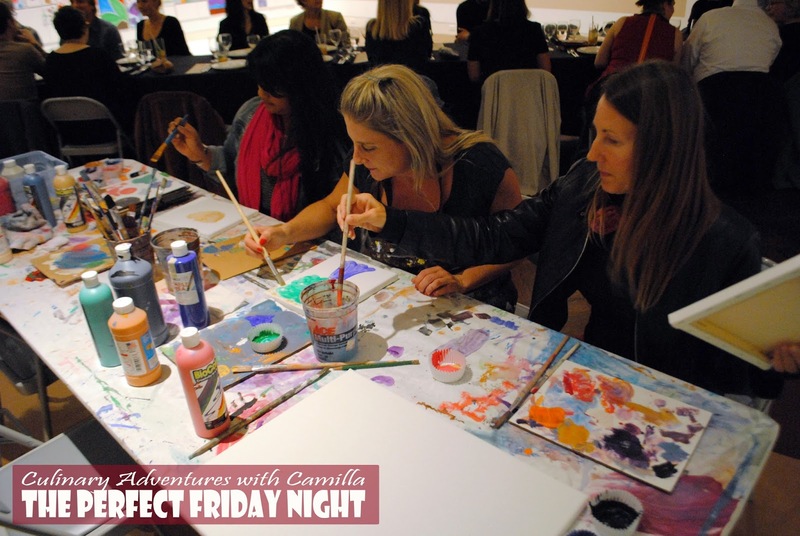 In between courses people wandered over and put brush to canvas. What fun! 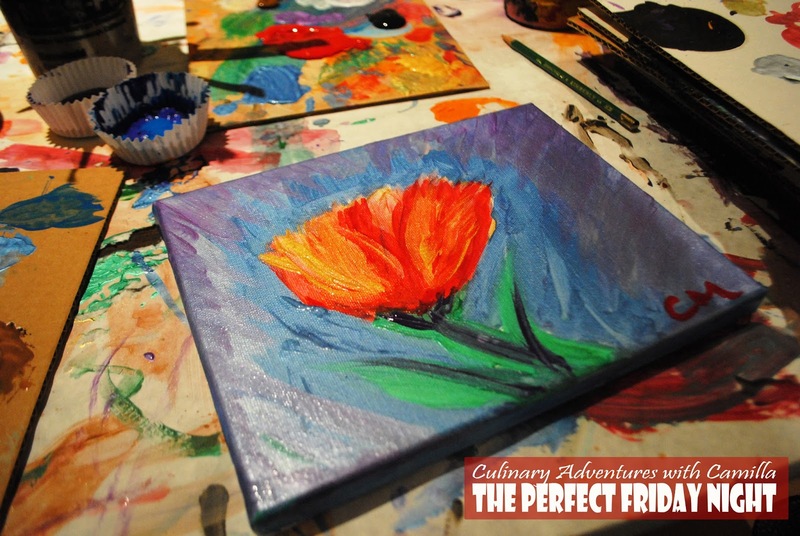 I opted for a small canvas and was pretty pleased with my tulip. Not bad for ten minutes, if I might say so myself. 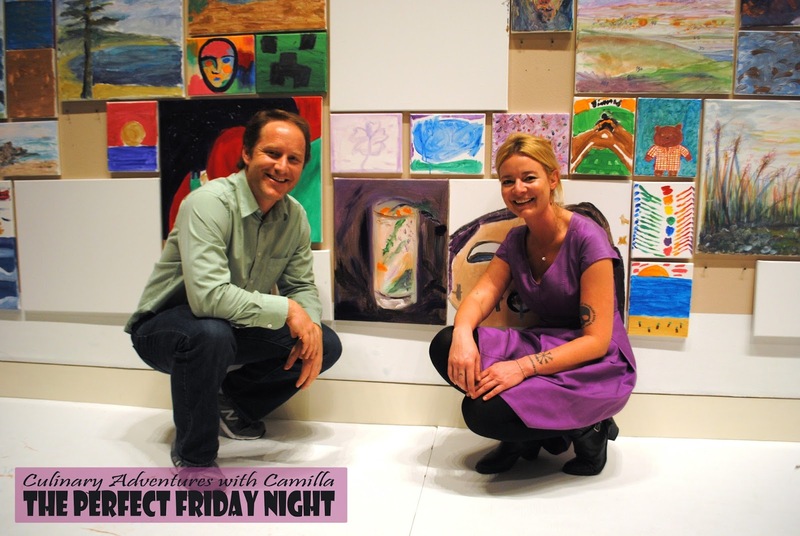 That was the art and libations part of the evening. 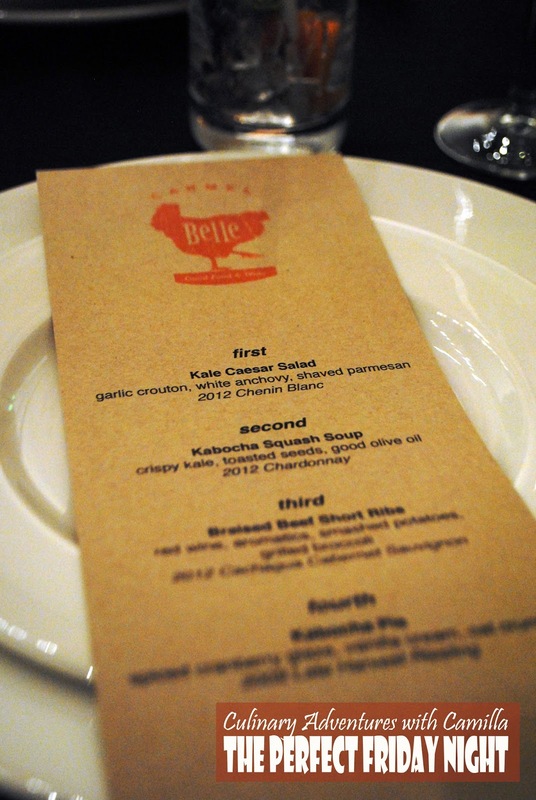 On to the food from Carmel Belle, prepared by the talented Chef Kyle Odell. He even did some of the serving. First Course: Kale Caesar Salad. 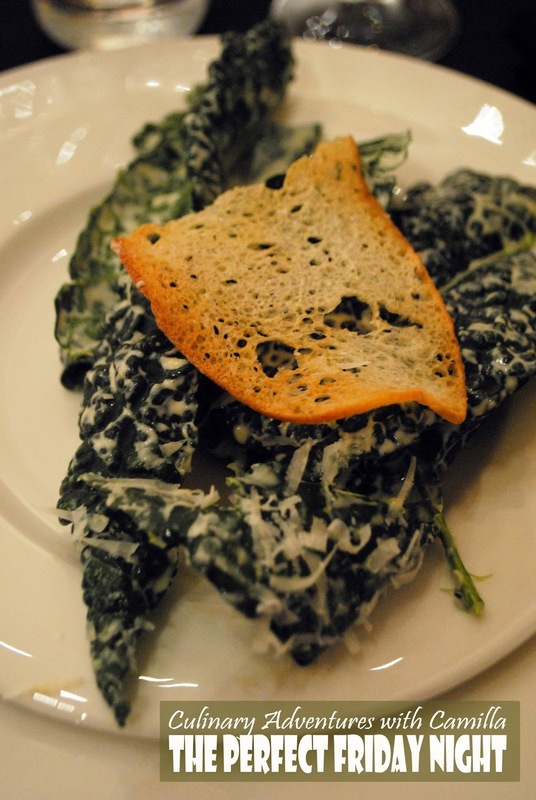 Luxurious dino kale from Serendipity Farms with a crisped garlic crouton, white anchovy, and shavings of parmesan. This was paired with a 2012 Chenin Blanc from Heller Estate Organic Vineyards. Second Course: Kabocha Squash Soup. We were given bowls with crisped kale and toasted seeds. 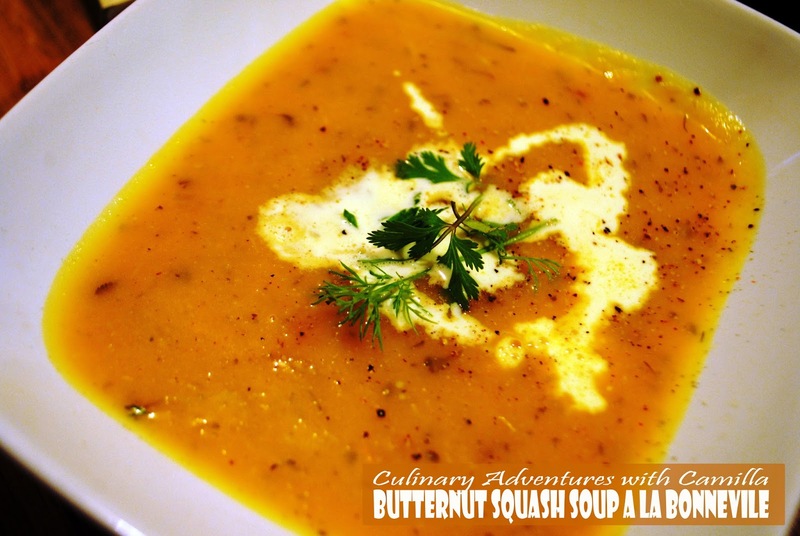 A splash of good olive oil was followed by the piping hot soup with kabocha from Serendipity Farms. This course was paired with a 2012 Chardonnay. Third Course: Braised Beef Short Ribs. 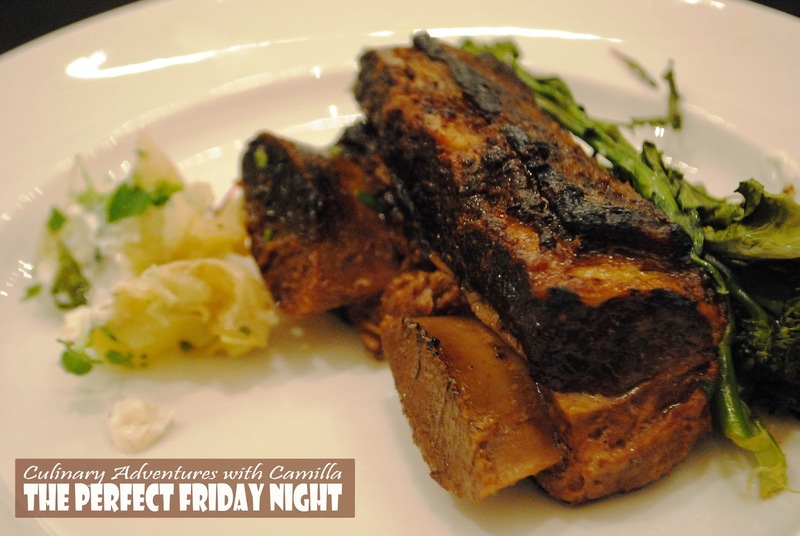 "Grass-fed short ribs were provided by happy cows along the Big Sur Coast by Mark Shelley of Tassajara Meats." Chef Kyle served them with smashed potatoes and grilled broccoli. Heller paired this course with a 2012 Cachagua Cabernet Sauvignon. 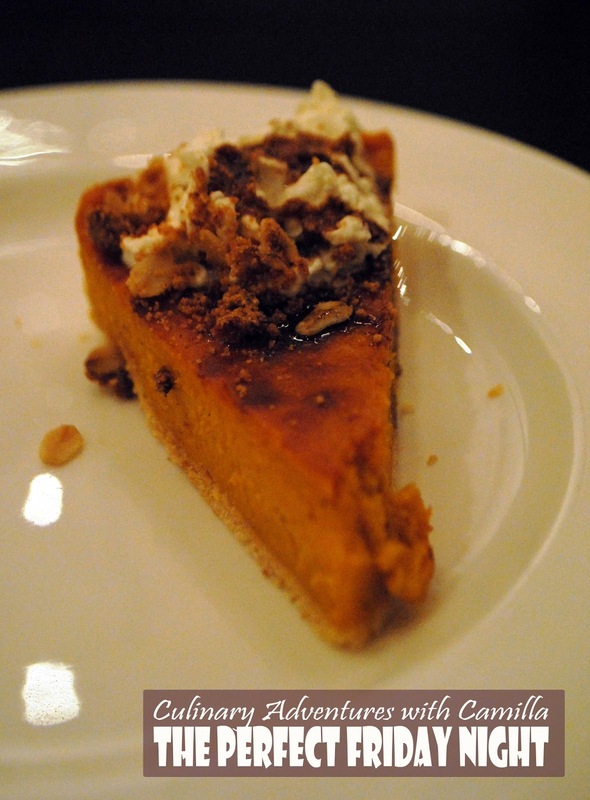 Fourth Course: Kabocha Pie. Not having much of a sweet tooth, this had the perfect balance of sweet and not sweet with a spiced cranberry glaze, vanilla cream, and an oat crumble. I didn't have the wine, but Heller poured a 2009 Late Harvest Riesling with this. Just as we took the last bites of our pie, we looked at the time. Whoops. We were twenty minutes late to grab the boys from our friends. I felt a little like Cinderella racing the clock at the end of the ball. Until that though, it was perfect. As I said: perfect Friday night. I can't wait for the next pop-up. Wine Tasting 101 - Drink What You Like!